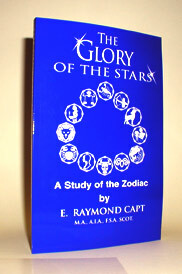 The author in this exciting and information filled book makes the dramatic connection between the Zodiac and the Bible and in so doing reveals The Gospel of Jesus Christ in the stars. Psalm 19: 1-4: The Heavens declare the glory of God and the firmament sheweth his handiwork. Day unto day uttereth speech and night unto night sheweth knowledge. . . . Their line is gone out through all the earth and their words to the end of the world. In them hath he set a tabernacle for the sun. Having declared that the heavens reveal God's glory the Psalmist informs us that the heavens declare a message in a language that is understood by all peoples. These starry worlds as such do show forth His handiwork but explain little about the glory of God. How then can the stars be made to speak in a language everyone can understand? The answer is quite evident. Pictures speak in all dialects. They speak a universal language to all peoples everywhere. Somewhere in the earliest ages of human existence the visible stars were named. Certain ones were arranged into groups by someone throughly familiar with the laws of astronomy. Those names and groupings were at the same time included in certain figures natural or imaginary but intensely symbolic and significant. Today we know them as Constellations. Twelve constellations make up the Zodiac. These major star groupings form a belt which circle the sky close to the plane of the earth's orbit around the sun. Modern atlases list them in the following order: Aries Taurus Gemini Cancer Leo Virgo Libra Scorpio Sagittarius Capicorn Aquarius and Pisces. It is well known that the ancient races drew charts of these Zodiacal Signs that ancient astrology was actually the father of astronomy. Astronomers sometimes denounce the Zodiac as unnatural and confusing yet they have never been able to brush it aside or substitute anything better or more convenient in its place. The Signs of the Zodiac are a part of the common universal language of astronomical science. The Zodiac is found in religious faiths and pagan superstitions. Astrology is based upon it. The Bible is replete with it. The Companion Bible tells us that all the verbs in the second half of Psalm 19 are of an astronomical nature. The written words of Scripture parallel the words written in the heavens and preserved in the Signs of the Zodiac. Were such wonderful creations of almighty power and wisdom without purpose or meaning? Was there some original divine science connected with the star designs. The purpose of this study is to present the findings of past eminent scholars together with those of modern scientific investigators in order to show the stars do reveal words written in heavens - words that declare the glory of God.